ACPEN webcasts are sponsored by Business Professionals' Network, Inc.
Business Professionals’ Network, Inc., which produces the Accounting Continuing Professional Education Network (ACPEN), is registered with the National Association of State Boards of Accountancy (NASBA) as a sponsor of continuing professional education on the National Registry of CPE Sponsors. State boards of accountancy have final authority on the acceptance of individual courses for CPE credit. 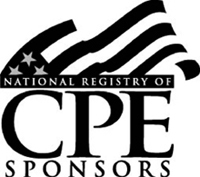 Complaints regarding registered sponsors may be addressed to the National Registry of CPE Sponsors, 150 Fourth Avenue North, Nashville, TN, 37219-2417. Telephone: 615.880.4200. Web site: www.nasba.org. Business Professionals' Network, Inc’s National Registry Sponsor Number is 107810.